Did God have a definite and discoverable plan for creating America? In a Christ in Prophecy series titled “America’s Christian Heritage,” Dr. David Reagan interviews a historian who emphatically believes God had such a plan, beginning from as far back as Christopher Columbus. For over forty years the Rev. 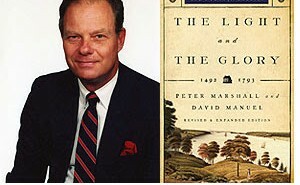 Peter Marshall has gained national recognition as a teacher and writer on America’s Christian heritage. 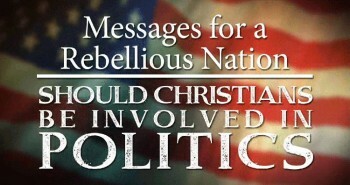 Because he believes that our nation is in moral and spiritual crisis and that the only hope for restoration is revival, his increasingly prophetic ministry focuses on two major themes — recovering the original American vision with the truth about our Christian heritage, and putting 2 Chronicles 7:14 on national repentance into practice. Son of the famous Senate chaplain Dr. Peter Marshall and author Catherine Marshall, Rev. Marshall has devoted himself to a continent-wide ministry of preaching, teaching and writing. 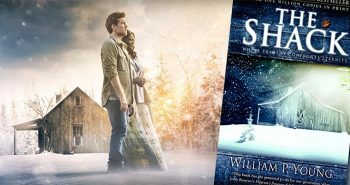 He has co-authored three best-selling books about God’s call on America and His hand on our history — The Light and The Glory, From Sea to Shining Sea, and Sounding Forth the Trumpet. His ministry is called Peter Marshall Ministries. Rev. Marshall: The evidence shows that the original Christian settlers who came to this nation, particularly in New England with the Pilgrims and the Puritans, had a vision to put the Gospel of Jesus Christ into practice in the New World, on a new continent, 3,000 miles away from anybody who could prevent them, and to create a society based on the Biblical principles of self government, in that we govern ourselves first in obedience to God. We then are to put Christ’s Second Great Commandment into practice to love our neighbors as ourselves. In other words, if people took the Bible seriously and put those Biblical principles into practice, they could create a society that would have liberty and justice for every soul. That is the original founding vision for this nation. Dr. Reagan: In modern times that vision has fallen on hard times. We have the revisionist historians today. One of the persons that they seem to have zeroed in on is Christopher Columbus, the fellow who opened up this part of the world to Europe. He was a hero in American history for many years and yet today he is viewed as a villain, as a barbarian who should have never have come here and it was a tragic mistake that he ever did. They say he was just a greedy guy who was looking for gold. 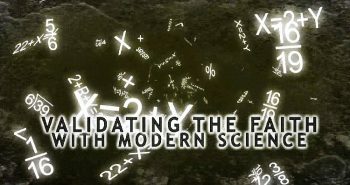 What is the truth about Christopher Columbus? Rev. 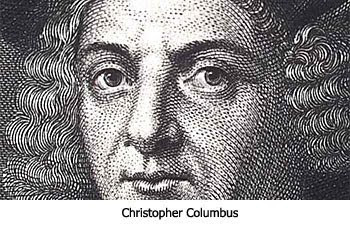 Marshall: What you have been expressing, of course, is the politically correct view of Columbus. Very few people that are committed to that kind of politically correct view ever have looked into the life of the man. They know nothing about him. It is simply a political project. But, the truth is when you do the research on him what you find out is that he was not only a committed Christian, but he was a brilliant Bible scholar able to read the Old Testament in Hebrew the New Testament in Greek. He was a Third Order Lay Franciscan, which was unusual for a clergyman or for a priest in pre-Reformation Europe, never mind a layman. A Third Order Lay Franciscan wore the brown Franciscan habit, which he wore the last three years of his life. Actually, interestingly enough, Columbus was involved in a charismatic renewal movement among the Franciscans. Dr. Reagan: I know he was also a student of Bible Prophecy. Dr. Reagan: Didn’t he actually write in his diary or log that he felt led of the Holy Spirit to come here? Rev. Marshall: In that book of prophecies and in one of his letters he says, “I could feel it was the Lord who put it into my mind. I could feel His hand upon me… the fact that it would be possible to sail from here, Europe to the Indies.” Then he said, “All who heard of my project rejected it with laughter, ridiculing me,” which you know we learned in grade school. Here is the next sentence, “There is no question the inspiration was from the Holy Spirit because He comforted me with rays of marvelous inspiration from the Holy Scriptures.” I didn’t learn that in grade school, and I don’t think many of us did either. 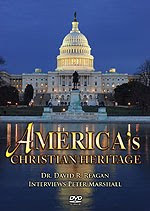 Dr. Reagan: I suspect that his strong Christian commitment may be one of the reasons he is being so severely attacked today in a society that is becoming increasingly secular. Rev. Marshall: Yes, absolutely! What he has become is a political football that is being kicked around by the Native American Indian lobbyist and so forth. He has become the symbol or sort of the poster boy for villainy for the European Age of Discovery in the America’s. He gets blamed for everything. Most of the atrocities that took place in Latin America were committed after he died. 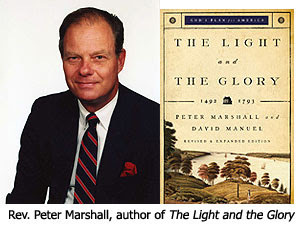 America’s Christian Heritage is a 70-minute interview of the Reverend Peter Marshall, historian and author of the book The Light and the Glory and son of the famous Senate chaplain Dr. Peter Marshall and Catherine Marshall, author of the Christy novels. I admit I didn't know CC was a true believer. I understood there is evidence that he was Jewish and he sailed when he did because of the Spanish inquisition that started – um – was it on the 9th of Av? Something about his mother and Nan persecuted as Jews, and Queen Isobella and King Ferdy didn't fund the trip, they had it off the Jews – I shall shut up now cos I furget. 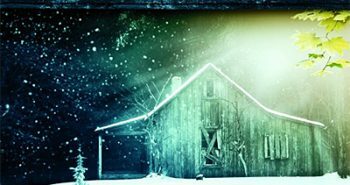 The Shack – Is It Christian?